A Painting Today: "100 Faces, No. 74"
I'm happy to be back with my paints and brushes again - had a wonderful, cozy Christmas which included snow, a rare occurence here in Atlanta. Just loved it. As I'm in the home-stretch with this series of 100 Faces, I'm sure my favorite paintings have been the people of color, including this new one. 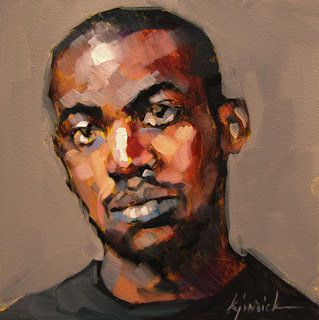 With darker skin, there's more layering of tones, cooler color on top of warm, rich color - the more I paint, the more I see. I wanted to thank Katherine Tyrrell, the host of one of the best art-related blogs on the web, Making a Mark. I've been nominated for the 2010 Best Artwork - Portrait/Figures, specifically a painting titled 'Hands of Time'. Thank you Katherine, you make me proud. Take a minute and see all the artists who've been nominated for several categories - I promise you'll discover some extremely talented artists - including my good friend Neil Hollingsworth, who's work is nominated for Best Portrayal of a Still Life. Already 74. Only 26 left. I feel sorry it will finish soon. I love your work Karin - No.74 is especially beautiful. Thanks for the pleasure I receive from looking at them. Good to see you back at the 100- like this fellow. Great tones. Congrats on nomination- saw it the other day and voted for you,teach:) Love that "hands of time" painting. Georgia snow- who'd have thought? Stay warm! This is a stunning portrait, Karin. I will be sorry when this series is complete- it has been an education to follow along. I, too, find this one to be especially beautiful. I love the touches of blue in his skin. Love this portrait. The skin tones are wonderful. Glad you are back from your well deserved break. Congrats on your nomination. "Hands of time" is one of my favorites. Thanks for the link Karin. You and Neil seem to be making a habit of getting nominated but then I know you've got a lot of people who love the work you both produce. Roger that Katherine - thanks for the correction. This is beautiful. I just love all the blend of warm and cool neutrals. I'm full of admiration. Another vote from another HH alumni! I just love your work, no question about it!